I love anything that is easy to grab and pop into my mouth! Especially when the contents are doing me some good. The autumn has arrived along with all the coughs and colds that come with it. Generally we are pretty healthy and seem to avoid coming down with these viruses. I like to think that it’s down to the lifestyle we lead and the diet we have. If we give our bodies the right tools to function with, it will perform well. Just think of our bodies like a car that runs on diesel, you wouldn’t dream of filling it with petrol would you?! The foods we eat help build a strong immunity. I’m very in tune with the messages my body sends me. As soon as I’m feeling run down, I know I need to slow down, drink lots of water, get an early night and load up on lots of healing and anti inflammatory foods and drinks. These magic balls are like my version of a throat lozenge. They are packed with vitamin C, antioxidants, anti-bacterial and anti inflammatory properties and ingredients that can stimulate the production of immune cells. They are also a fantastic source of fibre. With all of that information and the fact they taste great, I don’t think you have any excuse not to give them a try! Remove the stones from the dates, place in a bowl and cover with hot water. Leave them to soak for a few minutes. Drain the dates reserving the water and place in a food processor. Add all the other ingredients into the food processor, blend until the mixture forms a dough. If it’s dry add a little of the reserved date water. 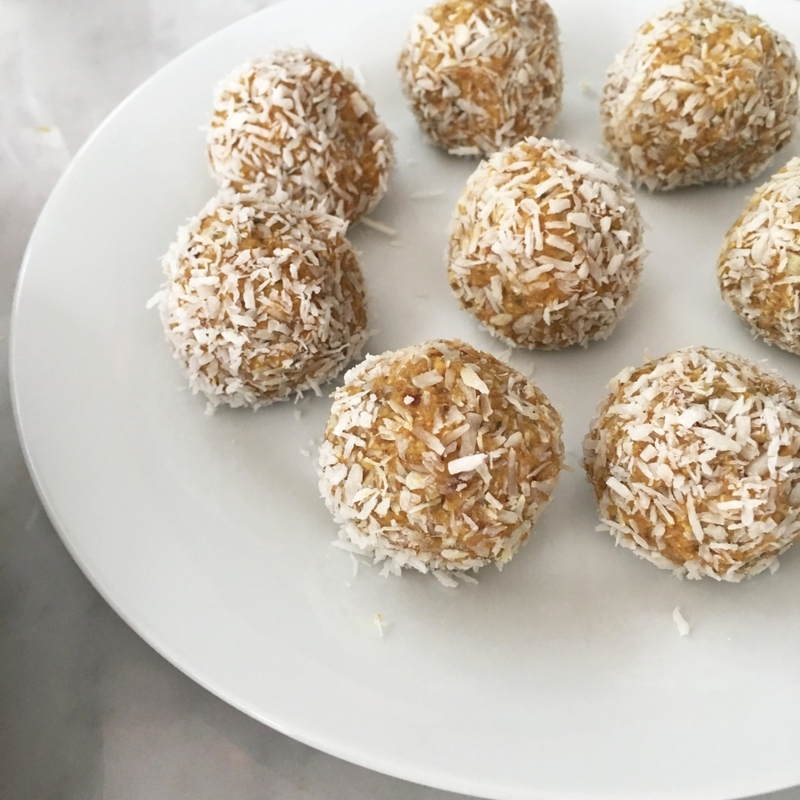 Scoop out a dessert spoon of mixture, roll into a ball and coat in the shredded coconut. Continue until the mixture is finished. This should give you about 20-22 balls. Store in a large jar or an air tight container in the fridge. Some links featured in this post are affiliate links. This will not affect the price you pay and are all from where I purchase my goods.